Riga International Airport is quite small but nice and well organized airport. It is located around 25kms from the city centre and easily connected via bus 22 (which arrives in Abrenes Street, duration trip: 30mins) or the Airport Express Minibus (operated by AirBaltic). All bus stops are located just outside the airport, you just need to follow the signs. Do your check-in at the hotel and go out immediately to enjoy this charming city. The main attractions are at walking distance, so no transportation needed. Riga is divided in two parts by the Daugava river. The Old town is in the centre of the city on the east side. 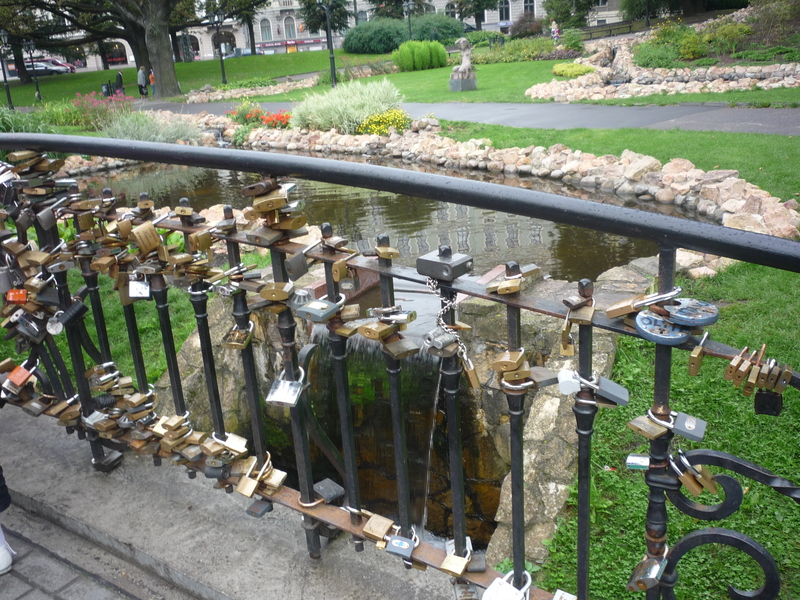 This is the best place of the city from an artistic perspective. Let’s start from the Northern Side, where you will find the Riga Castle: the castle is located on the northern side of the old town and it hosts the National History Museum of Latvia and the Museum for Foreign Art on one side and it’s the office and residence of the President of Latvia on the other side. The exterior is nothing special, but the museums are worth visiting. From Riga Castle take Maza Pils str and after some minutes on your left you will see the “Three Brothers” (Tris Brali). 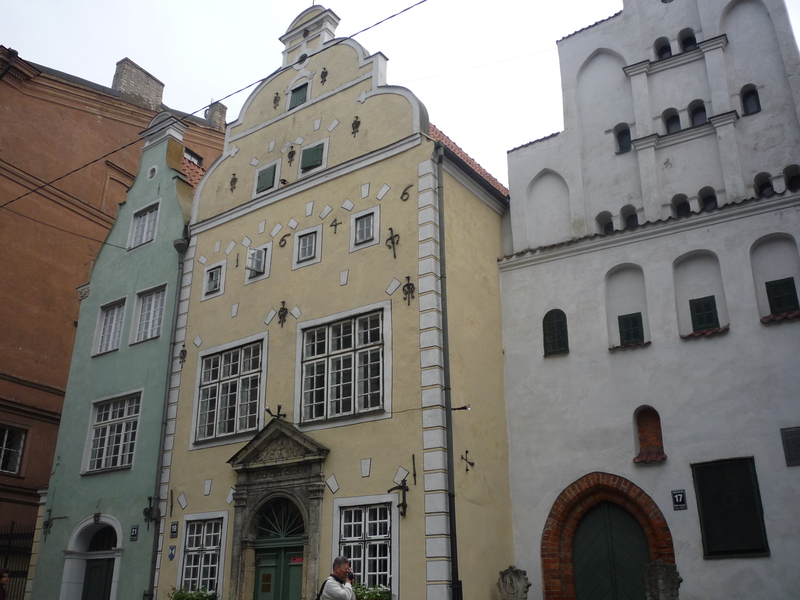 These are the oldest stone houses still standing in Riga, and an excellent example of medieval architecture. Looking at the size of these houses, you will feel like in Lilliput, since everything looks so small, starting from the narrow windows to the small doors. From the Three Brothers take Jekaba str on your right and you will get to the city main square, Dome Square. The square owns its name from the city cathedral that predominates the area. The exterior and interior aspect is not particularly attractive, although the great organ inside is worth being seen. Dome Square is a vibrant place during day and night, stop there to have a coffee or eat something or to listen to the live music concerts they usually have over there. From Dome Square take Skunu str and after 10mins you will arrive at St Peter’s Cathedral. 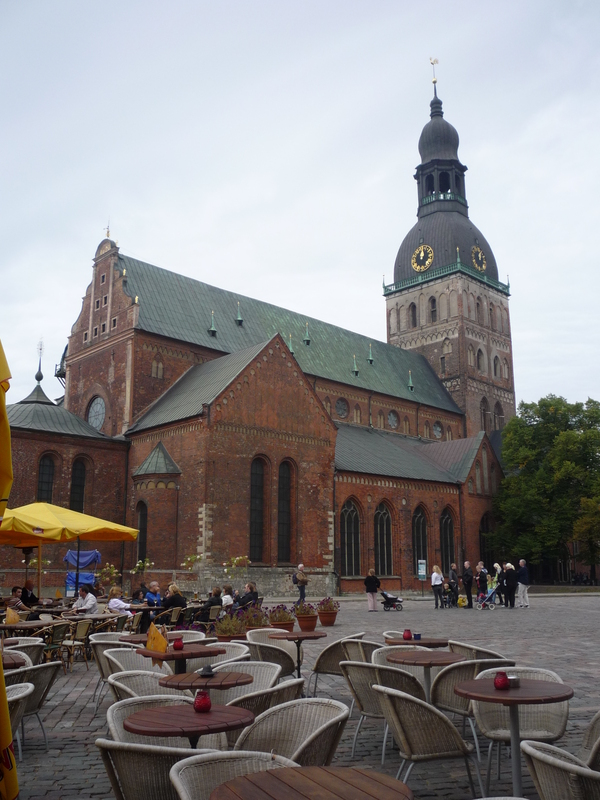 This is one of the main churches in Riga, where you have the opportunity to go on the top and enjoy a great skyline. Next to St Peter’s Cathedral is St John’s Church: dating back the 13th century, this small church is famous for its nice Renaissance-style altar and a Gothic-style ceiling. 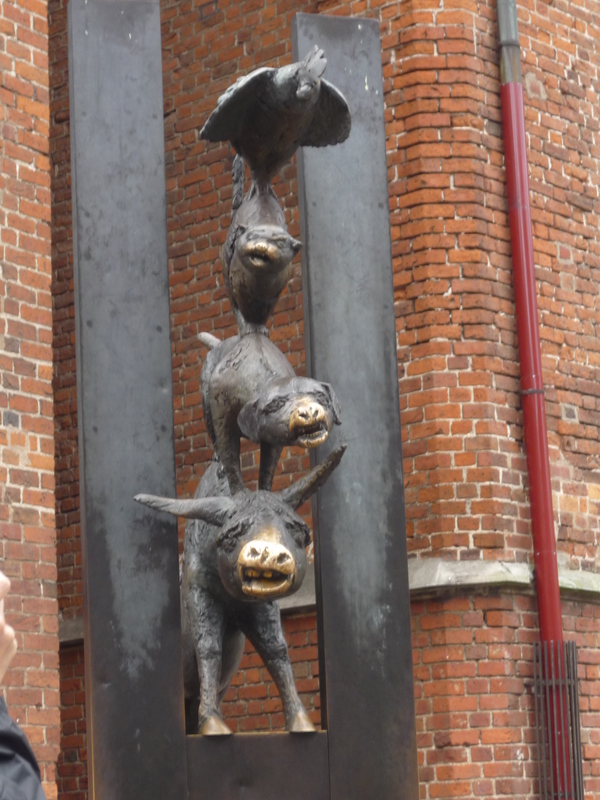 Just next to the church, your attention will be caught by the Bremen musicians, a very strange statue with different heads of different animals, freaking but funny! 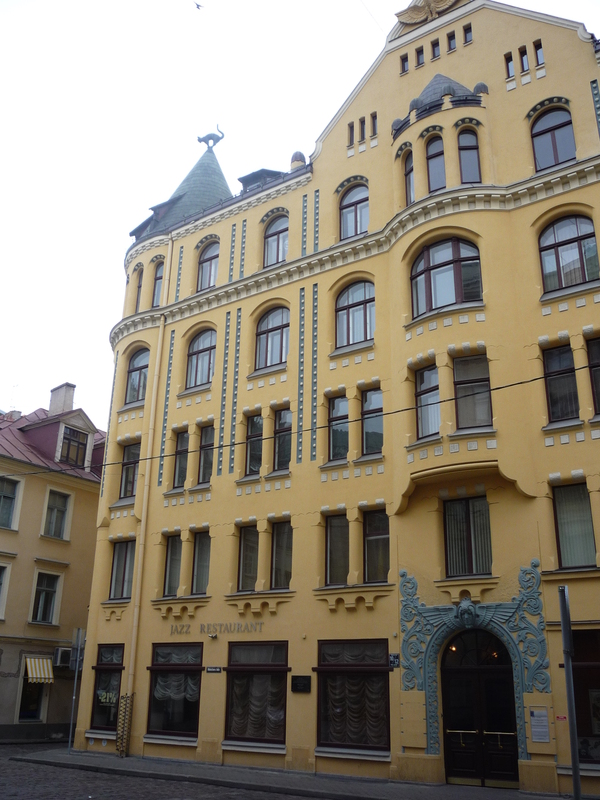 Now go back in direction of St Peter’s church and Kungu str and next to this street you will find one of the most attractive places in Riga: the House of Blackheads. Used in the past by the merchants, this magnificent building hosts today the Tourist Office and and an interesting exhibition space. The exteriors are very particular and with a nice game of shapes, colors and images. Now time to go and find the nature and the greatest skylines of the city. From the House of Blackheads keep on walking and you will get to the Daugava river bank, the main river of the city. Take a walk along the pedestrian-friendly Akmens bridge. 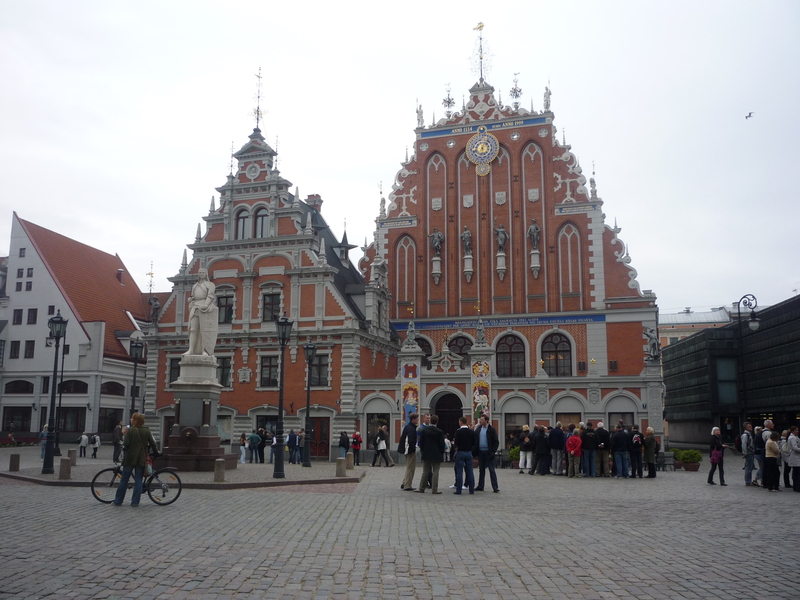 The second day in Riga will be dedicated to the eastern side of the centre. You can start your trip from the Swedish Gate, the only remaining of the city ancient walls. From there, keep on walking and at the cross with Smilsu str you will find the Powder Tower, a tower that was hosting gunpowder and that now is part of the Museum of War. From there, take the street in front (Meistaru str) and you will get to the Cat house. 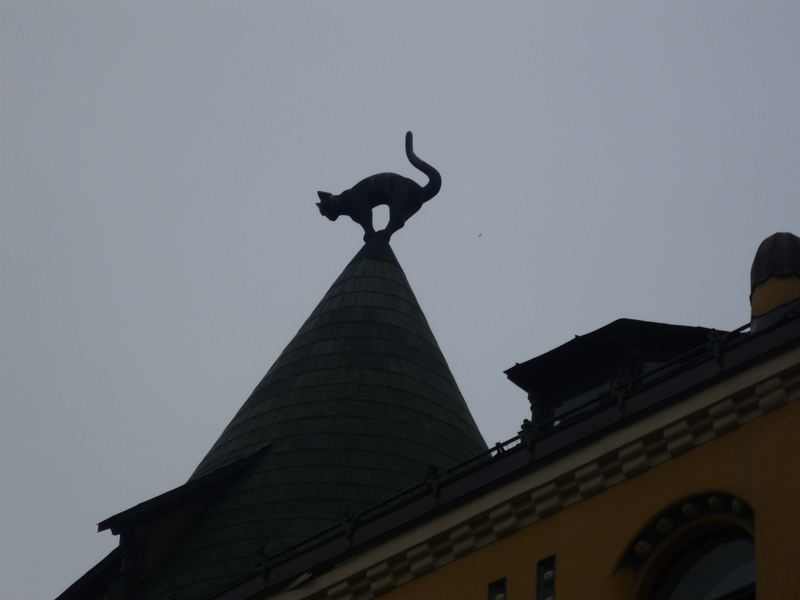 The building is well-known due to two metal cats situated on the roof of the building. This house has been constructed in 1910 as dwelling and office building. The owner of the building was not accepted in the Big Guild and, as protest, decided put two cats on the roof of building. Cats tails were turned to a building of the Big Guild, what clearly showed owner’s cynical relation to the Guild and its members. Such incident has caused a big scandal, but only by the order of the city council iron cats have been turned to other side. 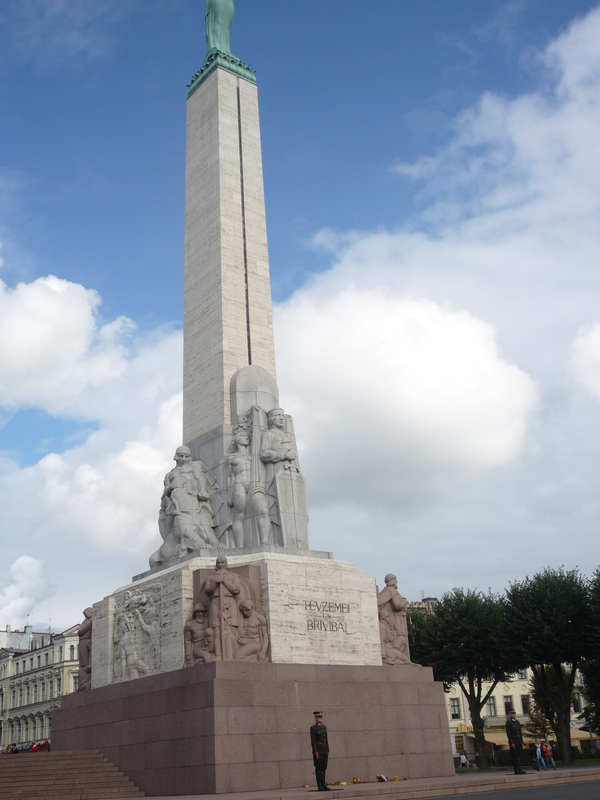 Keep on walking and then take Kalku str on your left and you will then arrive at the Freedom Monument: this great statue was erected during Latvia independence – surviving also to the Soviet invasion – and shows a woman holding three stars, which symbolizes the Freedom who embraces the three Latvian regions. Around the Freedom Monument is Bastejkalns Park, probably the most famous park in the city. You can immerse yourself into a great and colorful nature. 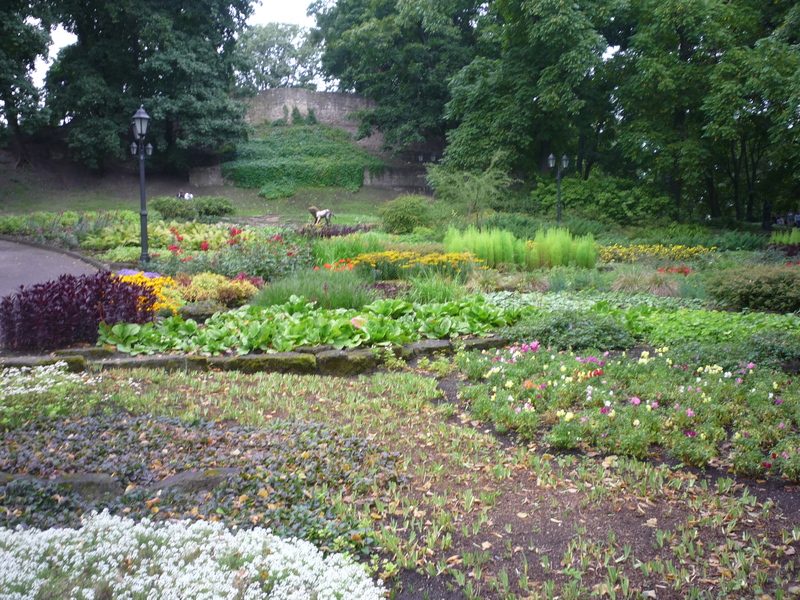 The romanticism is at its peak in this park: nice paths surrounded by flowers, benches, and small lakes. ! After a deserved break in the park, go back to the streets and walk in direction of two most beautiful streets of Riga: Alberta and Elizabetes streets. If you’re an Art Nouveau lover, you cannot miss these streets full of Art Nouveau buildings. 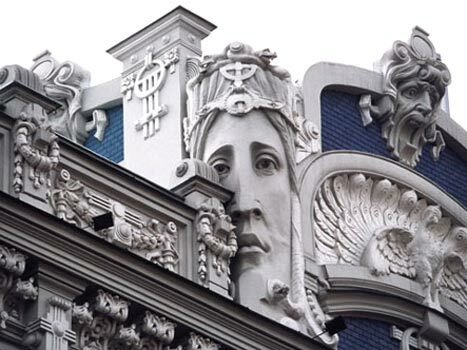 Riga is indeed one of the main European cities in terms of Art Nouveau presence: you can find hundreds of masterpieces over there! 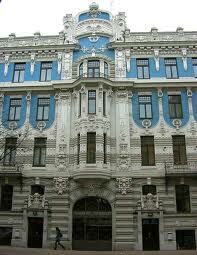 Most of these buildings were made by Latvian artists, among whom Mikhail Eisenstein was the most popular one. All the main aspects of Art Nouveau – dynamism, flowing lines, geometrical ornaments – are in these fantastic buildings in this area. 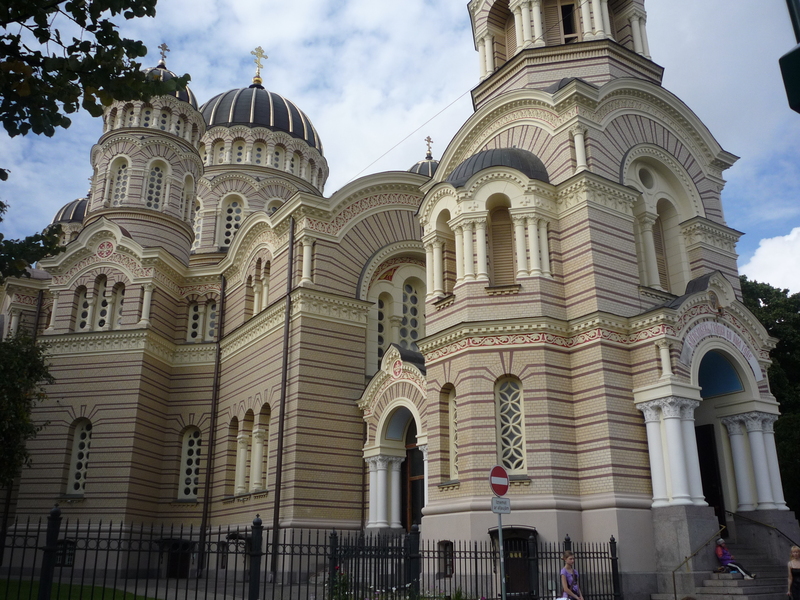 Along Elisabetes str, at the cross with Brivilas str, you will be captured by the Riga Orthodox Cathedral: this is the biggest Russian orthodox cathedral in the Baltics. Its Neo-Byzantine exterior is in a perfect harmony with the interior, where you can admire beautiful icons traditional of Orthodox cathedrals. During Soviet times, the cathedral was turned into a planetarium, but afterwards has returned to its original function. Heading southeast along Elizabetes, you will arrive next to the Train Station, and next to it you will see the massive Central Market. Find everything you need there, from food to houseware. Directly east of the market is the beginning of Maskavas, or the Russian District of Riga.